The closing performance of the 1969 Woodstock Festival by Jimi Hendrix was a remarkable one in many ways, brilliant in some, sad in others. By 1960 Hendrix was a global superstar, he was a headline act playing to huge audiences in America and the choice for closing the huge Woodstock festival. Well, second choice technically speaking. First choice was the cowboy Roy Rogers whom the organiser Michael Lang wanted to sing Happy Trails as a salute to his and many of those in the crowd’s childhood days but Rogers declined. But The Jimi Hendrix Experience was no more by then and Hendrix put together the largest band he had ever played with, bassist Noel Redding was gone but drummer Mitch Mitchell remained along with Billy Cox and Larry Lee on rhythm guitar. Neither of the newcomers had played in front of a large crowd before and two performances after Woodstock they disbanded. It was the start of the end and the timing of their performance added greater, sadder significance. The festival was huge, a successful farce if that is a thing, the crowds flocked in numbers nobody had anticipated, the rains came down, there were endless delays and technical glitches but when the music started none of that seemed to matter. 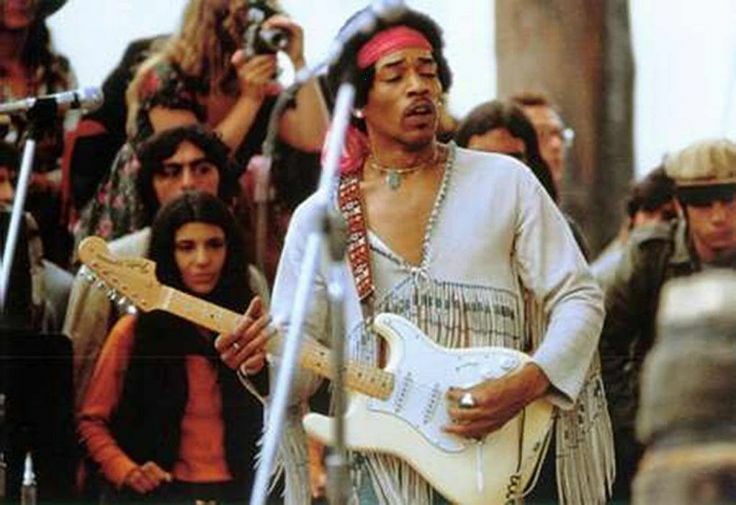 That Hendrix was top of the bill over the likes of The Who, Jefferson Airplane, Crosby, Stills, Nash and Young, Janis Joplin and Grateful Dead is testament to his stature and the performances they, and many others gave, meant Jimi Hendrix and his band Gypsy Sun and Rainbows had to pull out all of the stops. There were some memorable performances that weekend, during the day it will be remembered for the emergence of Santana and Joe Cocker but it was the evenings which really set the mood and that Hendrix missed playing at night gave his performance and the festival’s end a certain poignancy. Delays meant that performances were pushed back but the promoters offered Hendrix the opportunity to play the last set of the night but he chose to wait until the morning when all but 30,000 or so of the crowd which peaked at almost half a million, decided to leave before he began. The crowd were weary, it had been an incredibly intense weekend of drugs, drink and fornication but Monday marked a new week and commitments for many. Even hippies had jobs and college and so Hendrix stepped out in front of a vastly reduced audience in the middle of the morning. For filming and photographing Hendrix in full flight the morning light proved a godsend, he played a remarkable rendition of The Star Spangled Banner and stunning versions of Voodoo Child, Red House and Hear My Train a’ Comin’. Hendrix was under pressure to revert to the tried and tested trio of the Experience band which generated millions for the record company but the artist wanted to explore new horizons as the decade came to an end and this concert, this performance, seemed to me to be the ultimate send off. We should remember it for that, for Hendrix in fringed jacket and white Stratocaster but there is something about the way it just ends, before lunchtime with nothing left but a stage full of road crew and cables and a scattering crowd amongst a sea of litter. His version of The Star Spangled Banner was a magnificent statement about America and the 1960s. Many believe it to have been an anti-war cry but Hendrix said it was for all of America and those who live under its flag. But it was surely more than that? By 1969 America and most of the Western world had been irrevocably changed through the legitimate protests of the disaffected and the young. Civil and social rights, anti-corruption and the horrors of Vietnam boiled over onto the streets and the soundtrack was new, raw and powerful and nothing encapsulated that soundtrack better than Hendrix and his distorted version of America’s anthem. After the performance he collapsed with exhaustion, his premature death was but a year away and with it the hopes of a generation. The war in Vietnam raged on, Nixon crushed what remaining trust people had in those who govern and the rich got richer. The Woodstock hangover would be a lengthy one.